I have spent the last few weeks working on this response with Alan Wheatley, the Social Care Spokesperson of the Green Party and the last few days drawing it up for today's deadline. See below from the Green Party's national website. The Green Party's response to the government consultation on changes to Disability Living Allowance was forwarded this morning to the Department for Work and Pensions. The consultation will affect at least 3 million people, and it is one of the most important and controversial aspects of the coalition government's proposed welfare reforms. Alan Wheatley and Dr. Joseph Healy, Green Party spokespeople on disability, said: "The timeline given for the response to this consultation has been shockingly short. "Decent housing, transport and access to socialisation are vital for disabled people. The lack of funds or services can severely impact on the extent to which disabled people can participate in the community and lead full lives." In their response, Wheatley and Healy said: "DLA must not be income related. It must allow disabled people to be employed. And DLA must based on the social model of disability, not a medical one." - "Disabled people should not be made to jump through hoops in order to receive the help they need. As such, some conditions and impairments should be automatically entitled to DLA, for example, quadriplegia, being blind/deaf, some forms of bi-polar disorder, and chronic pain disorder where all avenues for a ‘cure' have failed." - "In applying for DLA, accessible formats need to be used, and jargon avoided at all times. People should be asked how their conditions impact on their lives on a daily, or weekly, or monthly basis (or a combination of all three). GPs, consultants, nurses, physiotherapists, and carers could also supply supporting evidence." - "Finally, we have grave concerns about insufficiently qualified pseudo-medical interviewers from ATOS Medical Services being used. The Department for Work and Pensions should have learnt from the Harrington Report about the insensitive use of such companies and interviewers. 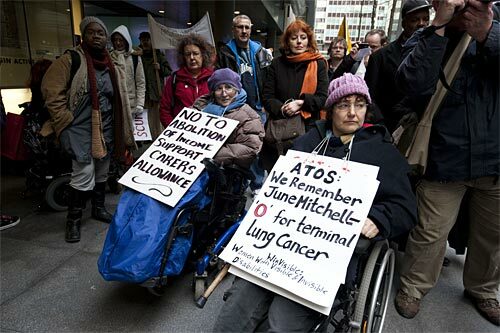 Healthcare professionals, such as ATOS, are considered by many disabled people as mere agents of the DWP who are rewarded by their paymasters to strike as many people as possible off disability benefits."